Contrary to claims by Interior Minister, Kwamena Bartels that he was not involved in the process that resulted in the selection of her daughter's company, investigation by the Enquirer has proved otherwise. Caught and confronted with his own hand writing, Bartel's explanation for his role in supervising the award of over ¢4 billion to his daughter's budding company is that "the letter he wrote for the facility to be extended to his daughter is just "only administrative" statement. But a member of the selection committee has told The Enquirer that "What does my man Bartels mean that the writing of the award letter to his daughter by his Ministry was only administrative, the selection process too is also a bureaucratic, administrative process. It is not a scientific research, neither is it a space exploration process. If one selects and another signs, we are all doing the same thing. We are all contributing to one process. In Bartel's case, he went the extra mile and coached his daughter and son-in-law and supervised the administrative process which led to the conclusion of the award for his facility." the member said. The member of the committee which selects companies that have applied to benefit from the government's Ghana Private Sector Development Fund-Italian Credit has said he does not recollect that Bartel's excused himself from the selection process for his daughter, adding that even the revelations from his "own mouth about events" culminating in the award of the 4 billion cedi facility to his daughter is shocking "to some of us"
The member said, Kwamena Bartel's conduct in this matter is a betrayal of his own government. The member noted that for a man who pioneered the Italian credit, he should have been the one to ensure that companies which benefit are credible enough so that we can all celebrate the success. Interestingly, out of the three processes which eventually led to the selection of Bartel's daughter's company, it has been confirmed that Kwamena Bartels participated in at least two, yet he claims he excused himself. 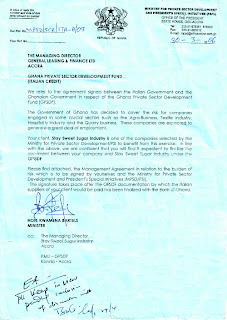 Kwamena Bartels is under the Enquirer's investigation for sprinkling over ¢4 billion from the Ghana Private Sector Development Fund on her a daughter's company, called Stay Sweet Sugar Industries.